Benjamin H. Bratton. 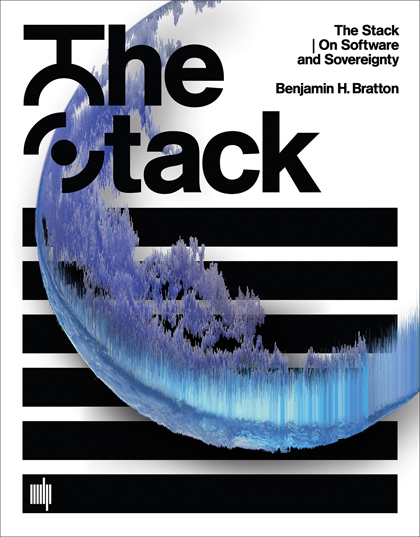 The Stack: On Software and Sovereignty. Cambridge, Mass. : MIT Press, 2016. 502 pp. I first met Benjamin Bratton after a small, one-day symposium. As evening fell and the audience escaped into it, the two of us remained. I don’t remember its content, but our conversation was intense—meandering and severe but also stimulating and surprising. After a while, it was also a bit overwhelming. I’ll take the blame for that—I am not necessarily built for Bratton’s level and volume of scholarly intensity. He is the more serious intellectual. I felt all those sensations again reading The Stack, Bratton’s tome of a treatise on planetary-scale computing’s imbrication with our very planet at every level. The book’s premise is that today’s computing systems are best understood as a global megastructure (the titular Stack). The Stack is layered, and Bratton identifies seven tiers that comprise it: Earth, Cloud, City, Address, Interface, User. Earth entails the material and energy-harnessing geological demands of computing; Cloud names the weird sovereignty of corporatized, global technology services like Google; City addresses the lived experience of cloud-computerized daily life; Address deals with identification as a form of management and control; Interface with coupling users to computers; and User with the human and nonhuman agents that interact with computational machines. Bratton’s fundamental claim is that the Stack is replacing other forms of governance and sovereignty—and with great political consequence. Some obvious questions arise: is the Stack a new formal structure, or do other global technologies, both present and past, also take on its form? The internal combustion engine is a possible candidate, as is agriculture. And then, are the layers of the Stack natural or analytical? Or even rhetorical? Examples and specifics aren’t as common as abstractions and generalizations, or else they are delivered via dalliances into a diversity of influences both real and fictional. Even so, The Stack delivers a compelling case for computing as a global leviathan—more a shady H. P. Lovecraft monster than a simple industrial infrastructure. It’s a welcome reprieve from so many facile and singular takes on computing—whether as tool, as network, as symbol, or as medium. But the book is a heck of a ride—by my estimate more than 200,000 words (even without the glossary, notes, and index) of viscous and sometimes truculent prose. Part of the genius is in that labor, of course. It’s as if Bratton occupies a parallel universe that converges mostly but not completely with mine. His ability to see that world in parallax affords the creativity and accomplishment of the book. Bratton urges the modern human to acclimate to the vertigo of the Stack, and a generous reader will take its form as an extension of its argument. But it pays the price in abstruseness. Like many books that justify mechanical difficulty and abstraction as endemic to the complexity of the goal, The Stack’s political ambitions might better be accomplished through clarity, condensation, and exemplification. The book risks becoming a tome to own and display, rather than a tool to use. There are worse fates for academic monographs, but Bratton’s explicitly claims to intervene in design and politics. The result offers promise and intrigue and possibly even utility to those who would take it further. For the rest, The Stack still demands to be read—or at least to be owned and thumbed through, a talisman for the further work it will doubtless inspire.